Wildlife campaigners are at odds over a new attempt to ban the global trade in polar bear parts. Some activists say the market for rugs and ornaments made from the bears is driving them to extinction, but others argue that the most pressing problem for the species is climate change and the disappearance of polar ice. The issue will be decided at a UN wildlife conservation meeting in Thailand in March 2013. “The drivers for the increase in recent years in the trade in polar bear parts are the extremely worrying and rapidly increasing prices being paid on international markets for polar bear parts,” said Mark Jones, executive director of the Humane Society International/UK. He points to the fact that in the five years up to 2012 there has been a 375% increase in the number of polar bear skins offered at auction, some selling for as much as $12,000. Every year around 600 bears are legally killed by hunters in Canada and in the decade to 2010 more than 30,000 bear parts were traded as trophies, rugs and ornaments. 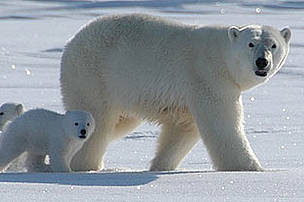 Opponents of the trade have now proposed a ban on the international sales of polar bear parts. It will be tabled at the next meeting of the Convention on the trade in endangered species (CITES) taking place in Thailand next March. The move is being supported by the US and Russian governments. The last time an attempt was made to change the ruling in 2010, it was defeated after the UK and the EU voted against. Mark Jones believes the UK government’s position is very influential and wants them to support the ban. “We urgently need the British government to step forward and be a champion for polar bears by supporting their maximum protection,” he added. But some prominent campaigners are against changing the protected status of the bears. WWF has had a long association with the iconic species but believes that the threat from international trade is not significant compared to the threat from climate change. “If we were tempted to support it on the basis of trade being a major threat, it is not,” says Dr. Colman O’Criodain, WWF’s wildlife trade policy analyst. “We have to focus on what is the major threat and not distract ourselves with a relatively minor one. We can’t be arguing for the science when it suits us and then ignore it when it doesn’t suit our case.” he added. WWF are supported by other groups including Traffic International and IUCN. But Mark Jones says the Humane Society International have broad support for their position as well. “We’re members of a very big campaigning group called the species survival network and we do believe we have a very wide consensus among groups on this particular issue,” he said. Dr. Colman O’Criodain says that WWF won’t actively campaign against the ban and will accept it if it is voted through. But he argues that would be a bad outcome for polar bears. “You could say that this is just a distraction factor and that it could have the effect of making people think something has been done to address the threat when the net effect will be almost negligible,” he said. Indigenous groups in Canada are actively working against the proposed ban. And they particularly resent the fact that the US is leading the charge for change. “The American government is using the threat of climate change to justify banning the international trade in polar bear parts while utterly failing to do anything to reduce their own activities,” said James Eetoolook of the Nunavut Tunngavik, a group that represents Inuit interests. They argue that their own research in the western Hudson Bay region carried out earlier this year indicated that bear numbers were increasing rather than declining. Campaign groups in favor of the new ban are taking comfort from the fact that some governments are still undecided.